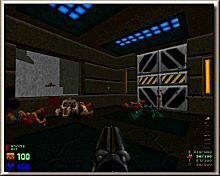 Home Doom2 Reviews Total Conversions Email me! 7 dark, nightmare1 texture bases. This is a fixed version of the old dark7. 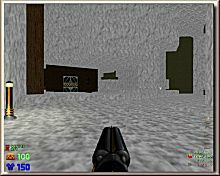 Fix includes: Better texture alignment, fixed map01 glitch were you can't jump out of the water near the cargo loading area, removed the double mod07 lumps, and various other fixes. Additional Credits to : Nick baker for the nightmare1 textures and the Darkening2 crew for the status bar graphics. I had to make the correction of a bug in the Map02 (the linedef 155 was attempting to execute the script N° 0, unexisting). So, I have deleted this action. I wrote an email to the man about it, and also about his great work. At the end, I discovered another... problem: the text was uncorrectly centered on the screen, at least for the resolution of my screen (1280x1024). I took a screenshot about it. So, I moved it of 2 spaces on the left (in the entry "MapInfo"). I was really very impressed by the great atmosphere. Thus there are musics (very pleasant mod tracks), I highly suggest to disable it once you will have listened it, for the purpose to don't cover any of the surrounding sounds coming from the environnement. Each of the important structure has its own sound, and they are very well done and used. 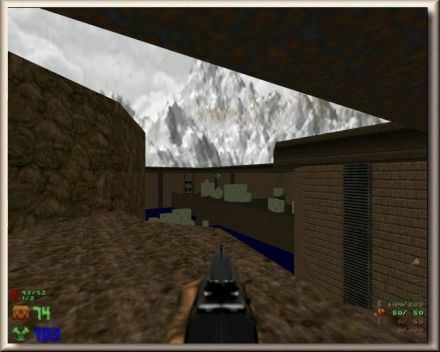 There's an almost Half-Lifeish atmosphere to most of the maps, with a Quakeish architecture. I played without and with the music, and I can say that, even if the music is very well accorded to the game, it's ruining the strange atmosphere obtained with all the sounds and voices. 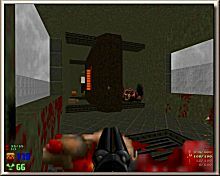 The textures are mostly extracted from The Darkening (made by The Darkening Crew) and Nightmare1 (made by Nick baker), and the sounds comes from Doom 64 and Unreal. Taking place in an overtaken arctic base, Dark 7 forces you to complete a series of 'mission objectives', coded by scripts, guiding you and giving you the needed informations about your objective, what is happening, and what is expected from you. So that, you can't stay perplex, asking to yourself what you have to do, what happened or how to open a closed door. It's the same thing when you hit a switch. Most of the time, the pwads don't explain to you what happened thanks to a switch, and you have even some difficulties (more or less irritating, sometimes) to understand what you've done and what you've to do. Here with Dark 7, everything is well explained, and your progression is guided nicely. Thus, you don't have the feeling to be directed, but you are like one of the heroes of the Serie "Mission impossible", with a headphone giving you the missions to accomplish, and you are alone to do the job. It begins slowly with the Map01, with monsters easy to kill and of a low number. You could think that you're playing a pwad with a bad gameplay, but the environnement gives enough to look at to keep your attention occupied. You discoverer lights, nicely colored, and one could say that there is an intensive use of colored lighted areas, each time very well done. Just what is necessary, nothing more. And it's the same thing for the architecture having the necessary details, without more. Then, things begin to be a little bit more complicated on Map02, with tenius monsters and horrible rocketters. Now, you are more attentive to don't miss any corner, where is perhaps, well hidden, one of the ennemies trying to stop your progression. You are now more nervous, thinking that all is not as easy as it appeared... At the end, you come on an opened area with rails... Rails? They are nice, but why? Anyway, you enter the small house. 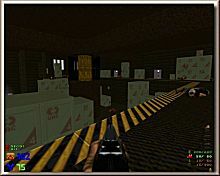 And you find yourselves on a flat truck in full speed on Map03, very well designed (simply, but efficiently), The walls on the sides show you the high speed, and the ground under your feet give you the feeling that it would be a bad idea to miss any of the platforms of the train, on which you have to make your progression !!! 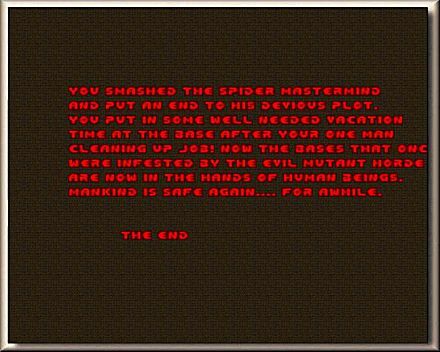 Quite easy level, but funny. The secrets are obvious, but here again, you are amazed by the nice use of deep water. 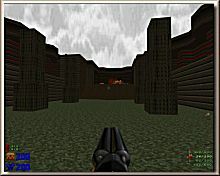 Once arrived at destination, on Map04, you begin to be more and more nervous, and you begin to think that you will die quite surely more than once. And you are true!!! The map05 is gigantic, but all was very well thought to give you enough challenge without being insane at any time. This artic station, with all its machines, is full of their noises and you applaude the decision to have disabled the music. There is a nice system of tunnels, with just enough space to allow some fresh air to come again in your poor and tired lungs. Did I forget to advise you to don't stay a too long time under the water? 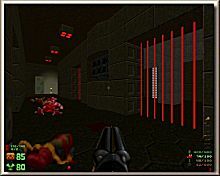 The Map06 was terribly disappointing, with a strange name "The Matermind", when you have to kill (VERY easily) 2 cyberdemons... And the extraordinary amount of ammos and life is there to let you understand that it was not intended to let you die, apart if you are a newbie with Doom, of course. 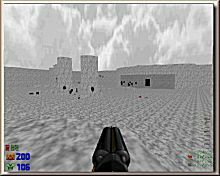 The last Map07 begins with a pleasant scripted scenario, and you understand why the previous level was named like that... But here again, nothing is done to make you being afraid at all. It's very easy, and quite disappointing again. Conclusion: I want more, and I'm asking myself why I'm losing my time to write this review when I have the sequel of this wonderful pwad to enjoy?!? - Total time = 3h32'43"
P.S. 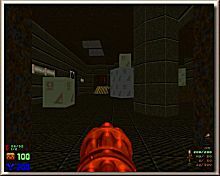 : this pwad had a sequel: "Dark7 Mission Pack1" aka "Dark7mpk", released some months later and rereleased on 2005 after some improvements.